Simple ACH can only be used if a merchant is set up to process an Automated Clearing House (ACH) transaction. Contact your processor to enable Simple ACH transactions in your account. To process a Simple ACH, go to ‘Transactions’ on the side menu bar and select ‘Simple ACH’ form the drop down menu. Enter the customer’s information including the Name on Check, Routing Number, and Account Number. 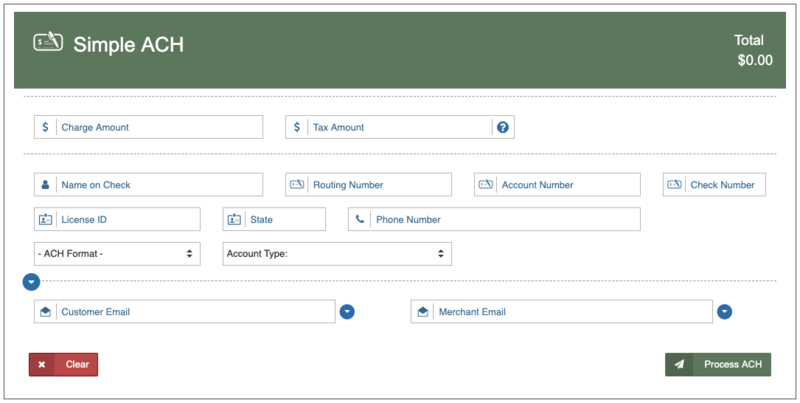 The Tax Amount, Check Number, License ID, State, Phone Number, Check Format, and the Account Type fields are all optional. To email the receipt to your customer, enter their email on the ‘Customer Email’ field. To send a report of the transaction, enter your email on the ‘Merchant Email’ field. Once all desired fields have been entered, click 'Process ACH'. A pop up window will appear with one of the three responses: 'Transaction Approved', 'Transaction Declined' or 'Error'.